Ashwell Prince became the first Lancashire batsman in 16 seasons to score a century in each innings of a match as the visitors turned the screw against Kent by building a mammoth 417-run lead in Canterbury. Already promoted as unbeaten LV= County Championship Division Two champions, Lancashire declared late in the day on 393 for 5 to leave themselves 10 overs and the final day of the season in which to wrap up their ninth win of a triumphant campaign. Kent, who lost veteran opener and first-innings top-scorer Rob Key to a fractured left thumb when fielding in the gully earlier in the day, reached stumps on 32 for 1 after losing emergency opener Daniel Bell-Drummond, leg before wicket for eight in Oliver Newby's final over. The hosts now face the tough prospect of batting out the final day in order to save off their third defeat and secure their 12th draw of the summer. Earlier, Lancashire openers Paul Horton and Luis Reece - resuming on their overnight total of 75 without loss - took their partnership through to three figures inside 45 minutes before Reece departed for 47. Drawn down the pitch by offspinner James Tredwell, Reece was beaten in the flight as he aimed to work to leg and was easily stumped by Kent's understudy keeper Sam Billings. Visiting skipper Horton sneaked a sharp single to mid-on to reach a patient half-century from 145 balls and with six fours as he and Prince battled through to a lunch total of 140 for 1. The second-wicket pair upped their tempo after the interval as Prince recorded a 107-ball 50 with three fours and a six, while Horton posted his third hundred of the championship campaign from 238 deliveries and with 10 boundaries. It was Horton's third hundred in four championship matches since returning from a twice dislocated finger on August 2. His run of form came to an abrupt end when, with his score on 106, he edged an attempted dab down to third man against Darren Stevens into the hands of Tredwell at slip. In tandem with Prince, Horton had helped add 167 in 50.1 overs for the second wicket to help take the visitors in to tea on 283 for 2 and a healthy overall lead of 307. In the over after the interval Karl Brown raced down the pitch to Tredwell only to slice an aerial drive high to Matt Hunn at mid-off, then Luke Procter heaved across the line to go leg before to Stevens. 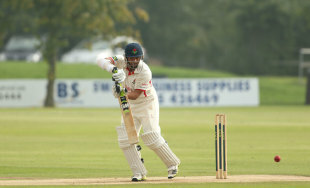 Prince then became the first Lancashire batsman since John Crawley at Colwyn Bay in 1998 to hit hundreds in both innings of a match when he reached three figures with a rasping off drive against Tredwell. It was his seventh four of a 190-ball hundred. Soon after, Prince cut hard at a short one from teenage debutant Matt Hunn but found a thick edge to be superbly caught by a tumbling Billings and make it 348 for five. Andrea Agathangelou marched in to smash three fours and two sixes in a 35-ball 50 against a tiring Kent attack to spark the declaration with half-an-hour of day remaining.